The photograph above, from a Valentine's postcard, shows William Henry Furniss's Maudslay bus going round the tram shelter in Crown Square. Glynn Waite was able to date the picture to either 1920 of 1925 when signs on the shelter were being replaced. From the Valentine's publication number it now seems likely that it was taken in 1920. Crown Square was not busy but the manoeuvre wasn't without danger and there were several accidents involving both alighting passengers and other vehicles. A taxi, owned by _ Upton, was parked beside the shelter. Above the taxi, the sign on the tram shelter reads "CAR EVERY 10 MINUTES". William Furniss senior (1861-1939) had arrived in Matlock with his wife and young family in the late 1880s, living first at Greenhill Terrace behind the Gate Inn. Before his marriage he had worked as a butcher in Ardwick, Manchester. He married Sarah Margaret Staniford, whose brother was the town crier, at St. Giles in 1883. In the late 1890s William was one of four proprietors who held the most vehicle licenses in Matlock: Messrs Hand and Son held eleven, Mr W. Furniss nine, Mr Jos. Boden eight, and Mr Anthony Walton five. Building work to house his growing business as a posting master began on his new premises in Crown Square in early 1899. John William Wildgoose won the contract to build a livery stables, shops, etc. The architect was Mr. David Mark Wildgoose and the project was to cost about £2000. The block was to be built "near to the Bakewell Road and adjoining the premises of the chairman of the District Council", Edward Slack. The development consisted of two shop fronts with a central arch between them through which the stables (later the garage) were accessed, with living accommodation above. The arch can still be seen, though it has been filled in. The Furniss's had a hairdressing business in one of the shops and Mrs. Furniss let out apartments (see advertisement below). 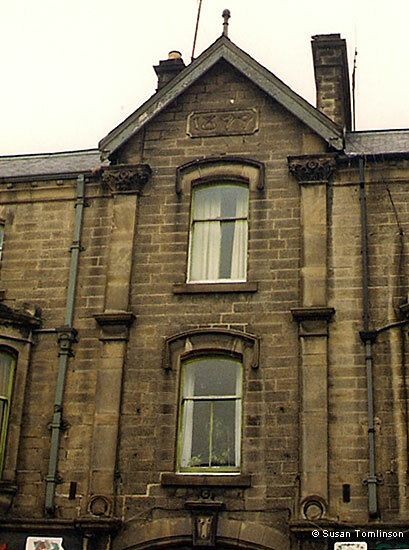 Sarah Furniss died in 1909, aged 45, and William married May Brookhouse in 1910.
raised, as today the date is below the roof line. The business expanded and William also used the Fish Pond [Hotel] Stables in Matlock Bath, the stables at the New Bath Hotel and Portland House Mews for motor vehicles. He was one of the owners of the four horsed buses that ran between Cromford Market Place and Matlock. In October 1912 he and William Hand provided a motor bus service along the same route, running at half hourly intervals. 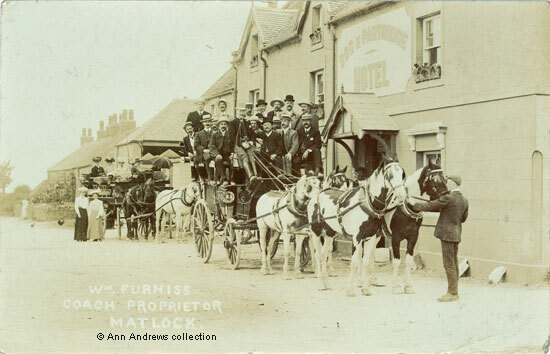 A William Furniss coach at the Dog and Partridge, near Ashbourne 1912. Given to Frank Clay by John Platts "an ex Comrade & Derbyshire Yeoman". The web mistress's grandfather is supposed to be in the picture. If so, he must be the young man at the head of the horses. Mr. Furniss is holding the reins. William's eldest son, William Henry Furniss, worked as a carriage driver for his father before the first world war. He had married Mary Elizabeth Allen at Farley Hill Congregational Chapel in 1910 and was one of the first men to be recruited in 1914. He wrote letters home to his father, many of which were reproduced in the "High Peak News". He was badly wounded during the Second Battle of Amiens (the Second Battle of the Somme) in 1918, losing his right leg in the battle and also suffered from shell shock. 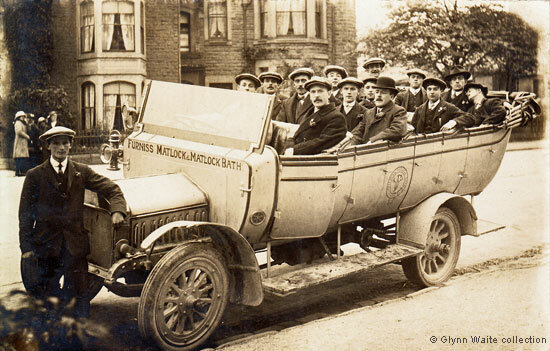 Furniss of Matlock & Matlock Bath, motor charabanc, about 1913. Whilst it is not known quite where this picture was taken, the web mistress has identified two, and possibly three, of the men and boys in the picture. The driver, standing next to the radiator grill and wearing plus fours, was probably Jack Brookhouse. In 1911 he was working as a chauffeur, undoubtedly for his brother in law William Furniss. Sitting in the front of the charabanc are the two friends William Henry Furniss and John Clay (my grandfather) . John is seated next to the vehicle's open door, whilst W. H. F. was in the driver's seat and peering over the windscreen. All the men are wearing a distinctive buttonhole. During the war William Furniss saw more of his employees join up. George William Boden of Spring Cottage Matlock Bath, for example, had worked for him as an omnibus driver, but was recruited in late 1916 and was killed a few months afterwards. Like others throughout the country William Furniss employed women to keep things going. In the spring of 1916 Miss Mabel Elizabeth Nash of Dale Road began working for him as a taxi driver. A month later he employed a female conductress on the Matlock to Cromford Route. 1903 invoice from William Furniss to 2 Albany Villas on Cavendish Road. to Chatsworth, Bakewell and Haddon and to Wingfield Manor. 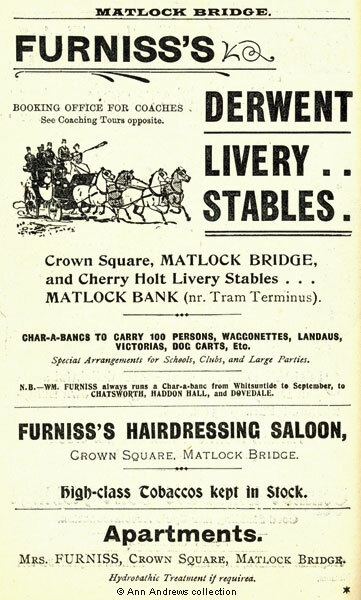 1903 advertisement for Furniss's Derwent Livery Stables, Crown Square and Cherry Holt and their Hairdressing Saloon [sic] in Crown Square. Mrs. Furniss also let out apartments. The advertisement refers to Coaching Tours and they published a long list of the tours they provided in the Guide. 1917 receipt, signed by May Furniss. Note how much the business had expanded since the 1903 invoice. Unfortunately, the war years were not kind to the Furniss family business; it experienced some financial difficulties which resulted in William having to give up the Crown Square Garage he had built. It was disposed of by private sale after a public auction was unsuccessful. It was not a good time to sell. By 1925 the premises were being used by Joseph Allen & Sons," jobmasters, motor car proprietors & funeral furnishers". When he returned home after the war William Henry set up in business in his own right and in 1924 W. H. Furniss was one of three local bus companies running a service between Matlock and Cromford. Sometimes the rivalry between the bus proprietors or their employees came to a head as it did in 1925 when a Furniss driver objected to the actions of a North Western driver and assaulted him in Matlock Bath. In the ensuing court case a local solicitor, Mr. Brooke Taylor, observed that "there was a deal of rivalry and a certain amount of hostile rivalry between the bus services". North Western were not allowed to pick up passengers in Matlock Bath but were clearly doing so, flouting the regulations that were in place. Following the closure of the tramway in 1927, W. H. Furniss was dealt a blow when the Council left him off the list of bus companies they were considering for the new bus route up the Bank; they informed him that they didn't consider his bus suitable. However, he continued to run a bus service, though not up the Bank. On 30 May 1928 Matlock UDC considered a list of applications for vehicle licenses. William Furniss (senior) applied for licenses for 3 vehicles and 3 drivers whereas William Henry Furniss applied for licenses for 5 vehicles, for 4 drivers and 1 conductor. Mr. Furniss Snr. owned a Motor Landaulette (for 6 passengers) and a motor charabanc (which would carry 14 passengers). W. H. Furniss owned a Motor Landaulette (also for 6 passengers), three motor charabancs (which would carry 14, 18 and 28 passengers respectively) and a motor omnibus that was designed to carry 32 people. Along with several other local firms they sold their bus business to North Western in the early 1930s. 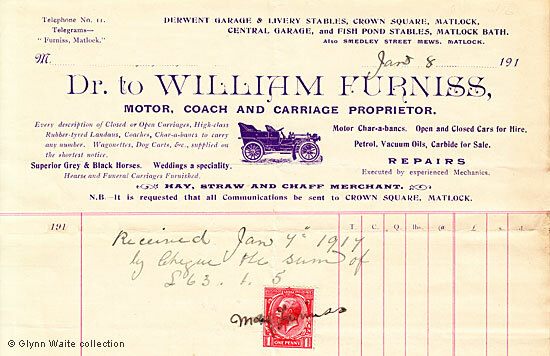 W. H. Furniss had by then diversified and he and his sons became motor haulage contractors. On the right is the back of a tram ticket, dating from 1904, that advertised William Furniss's businesses and his wife's Apartments. Furniss bus tickets (left and below) are very rare and the bus company's name is only on the back of the ticket. Interestingly, the ticket doesn't bear a punch hole - it was probably considered to be too expensive to buy a Bell Punch machine for such a small operation - so the conductor presumably tore a portion from the bottom corner to ensure that it could not be re-used. 1. Postcard of Crown Square, Matlock". Published by Valentine's, No.88717 in the collection of and provided by and © Glynn Waite. Published on page 48 of Glynn's book (see below). 2. Photograph of the Crown Square property, probably taken in the 1990s © Susan Tomlinson. 3. "Wm. Furniss. Coach Proprietor Matlock". Postcard by R. and R. Bull of Ashbourne in the collection of, provided by and © Ann Andrews. 4. 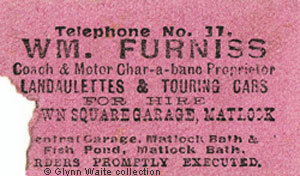 Furniss invoice in the collection of and provided by and © Glynn Waite. 5. Furniss's advertisement from "Abel Heywood's Guide Books, With Cycling, Walking and Driving Routes. Matlock Illustrated." (1903) Abel Heywood & Son, Manchester & London. In the collection of, provided by and © Ann Andrews. 6. 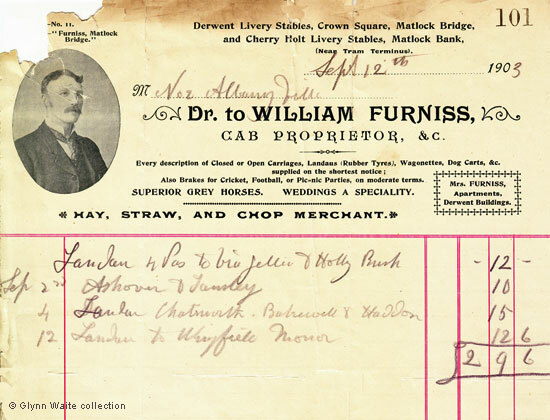 Furniss receipt in the collection of and provided by and © Glynn Waite. 7. Tram ticket in the collection of and provided by and © Glynn Waite. 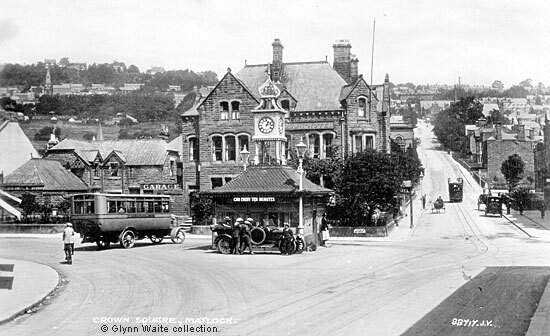 Waite, Glynn (2012) "The Matlock Cable Tramway", Pynot Publishing, 50 Main Road, Holmesfield, Dronfield, Derbyshire. ISBN 978-0-9562706-5-8. Robert Staniford was listed in the 1891 census and Kelly's 1891 Directory, Matlock Bank and Moor and Officials. He was a bill poster in the 1901 census. "Derbyshire Times and Chesterfield Herald", 22 May 1897. "Derbyshire Times and Chesterfield Herald", 14 January 1899. "Derby Daily Telegraph", 15 January 1910. Fire at Matlock Bath. The stabling adjoining the New Bath Hotel, which were sublet to William Furniss, caught fire. Reminisces of the late Frank Clay. Private papers © Ann Andrews. This would have been 1913-14. "Derby Daily Telegraph", 2 May 1912. The agreement was to be signed within next few days. Mary E Allen was the daughter of James and Sarah Allen. Her brother, Albert William, was to die in the early stages of the war. see Matlock war memorial. See Matlock's National Reservists & the Call-up Card. See both Matlock's War Memorial and Matlock Bath's War Memorial for John Clay and George Boden. They advertised in the following post war trade directories: Kelly's 1925 Directory (William, Field House, Smedley Street; William Henry, Premier Garage, Bakewell Road, with offices on Causeway Lane; Also Premier Garage, Matlock Bath) | Kelly's 1932 Directory and Kelly's 1941 Directory (William Henry, motor haulage contractors, Field House, Smedley St). From documents in Glynn Waite's collection. "High Peak News", 10 Oct 1925. Rival Bus Drivers. Researched by Glynn Waite.